Every year something spectacular happens at Rose Family Farms --- the hatching of the new baby ducks, quail, pheasants, and geese. I don't care how many times we watch and wait for this event it is still a miracle to watch that little one struggle its way out of the egg. Now, I would love to say it happens perfectly everytime but that isn't reality. There is alway a few eggs that don't hatch or a few little ones that just don't make it through the process of coming out of the egg. So everyone that successfully makes it way out safely always seems to excite us. Yes, even after 1000's of successful hatched little ones we are still amazed. For those who have never had the joy to watch a little duckling or chick pop out of the egg, we would like to share this wonderful experience. Although these are only still pictures at this time hopefully you can get to exprience some of the excitement. The process starts off when we gather the eggs from the duck house. Now each variety of duck on our farm has their own areas of the farm. Different breeds are kept seperate to maintain the purity of the breed. Several of our duck breeds will cross breed if allowed. Mallards must be kept in an enclosed excersice area to ensure they don't fly out. Yes, we could pinion their wings so they couldn't fly but then the birds would be useless to some of our customers. Eggs are gathered and wiped off with a damp cloth. Eggs to be used for hatching are never washed! As washing the eggs can force dirt and bacteria into the eggs through the pores in the shell. Egg gathering is done 2-3 times a day depending on the time of year. The eggs then proceed into the incubator room to be inspected carefully for any cracks or imperfections that could cause the egg not to hatch. We don't worry to much about the shade of the color of the shell as long as it is the right color for that breed. The eggs are then placed into egg racks that will go into the incubator. Each variety of bird has a different type of rack that is specially made to properly fit that type egg. To make this process easier for those loading the trays, the trays are color coded. 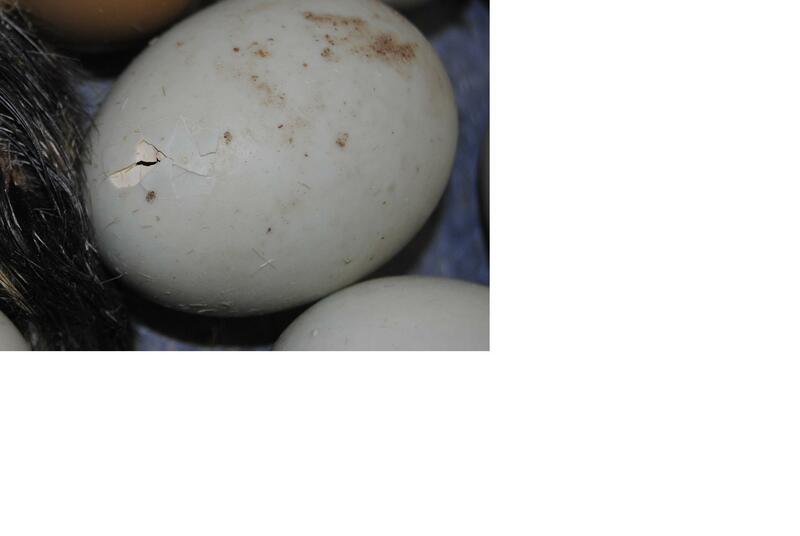 For example the mallard eggs go into a medium blue tray. After the trays are loaded they are placed into the incubator on the different racks. At this time the number code of the tray is written on the hatch board along with the date and location it was loaded in the incubator. Our hatch board on the wall is our guide to when to pull the eggs out of the trays and into the hatching area of the incubator. So each tray has a load date, a move to hatching tray date, and a date that they should hatch. Now hatching doesn't alway happen exactly on the hatch date. This can vary a few days. The incubator is a preheated cabinet that maintains the proper tempature, moisture level, and carefully & slowly tilts the trays back and fourth while the young chick or duckling forms in the egg. By using the incubator that is equiped with the tilting trays the eggs do not have to be manually turned twice a day. This is a good thing as it would be extremely time consuming to turn all the eggs twice a day. This automated system also takes out a lot of possible human error. The cabinets tempature and moisture level can be set to the optimum level for each variety of egg. For instance the best tempature for one type of bird eggs may be different than for another. Please see our hatch charts for examples. 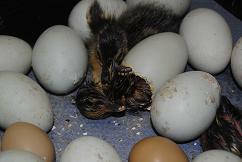 The number of days it takes the eggs to form the chicks or ducklings depends on the breed and type of birds. For example, the mallards take approx. 28 days where a coturnix quail only takes 17 days. 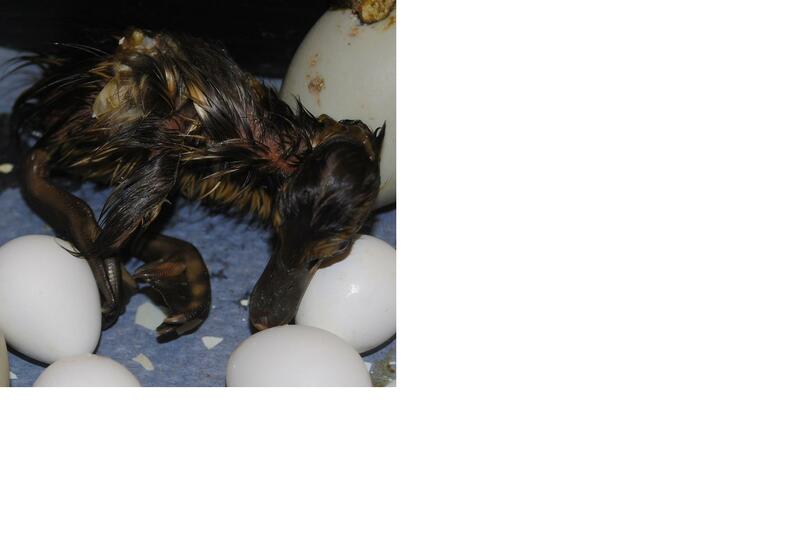 So with the mallards we candle the eggs at 4 days, 14 days, and 25th day to ensure they are developing properly. Candling the egg is the process of hold the egg in a dark room with a small light under it. 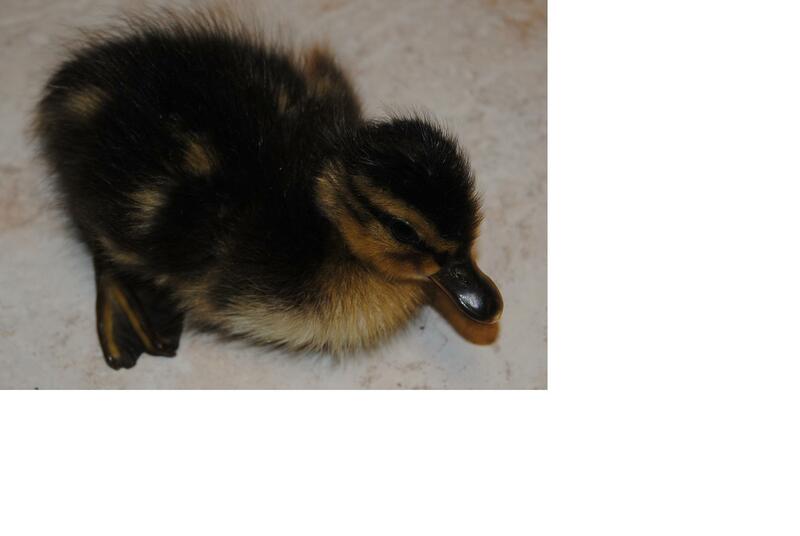 You can see the duckling developing at different stages. Some varieties of our eggs have too dark colored of a shell to do this real easily. For mallards we move them to the hatching tray at day 25. This is the last time the eggs will be moved or turned until the eggs hatch. By not turning them the last 3 days it allows the duckling to get in the proper position to crack the egg open and get out. When the eggs do start to hatch they go through several stages. We have tried to document the diffent stages in the gallery of pictures below. Starting on the left and going to the right on each row. For faster downloading we have placed a small picture of the stage with a clickable link to enlarge the picture for better viewing. Hatching can take an hour or more so we have used different eggs at the different stages to show this wonderful event. 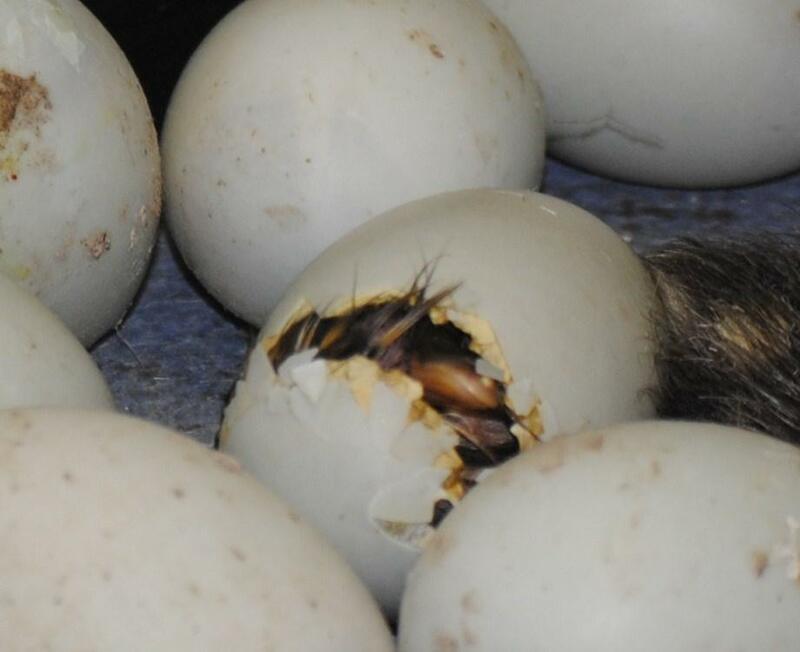 The duckling breaks out a small hole in the egg. 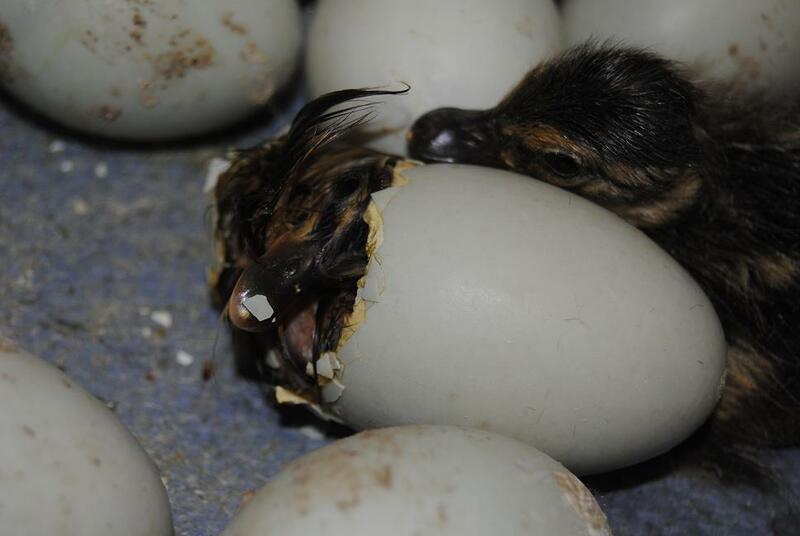 The duckling gets its beak through the hole and begins breaking a line all the way around the egg. The duckling actually spins itself around in the egg as it goes. The duckling pushes off the end of the egg. The duckling slowly squirms around in the egg to push itself out. This process can take a while since by this age the duckling takes up almost the whole egg. 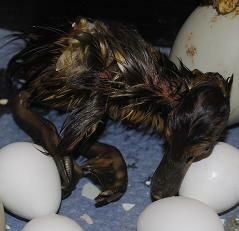 After the duckling finally gets out of the egg it is exhaulsted and wet. They will usally take a break and rest while they dry off. At this time is important that they stay in the heated incubator away from air drafts. 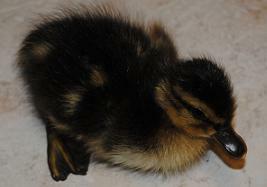 After the duckling is dry it will start chirping (yes, chirping not quacking) to find its hatch mates. They will then walk around until they all huddle together.